Responding to the urgencies of the moment and recognizing the need to transform museums and our cultural work within their spaces, The Museum and Exhibition Studies (MUSE) Graduate Program at the University of Illinois at Chicago offers this new publication series. 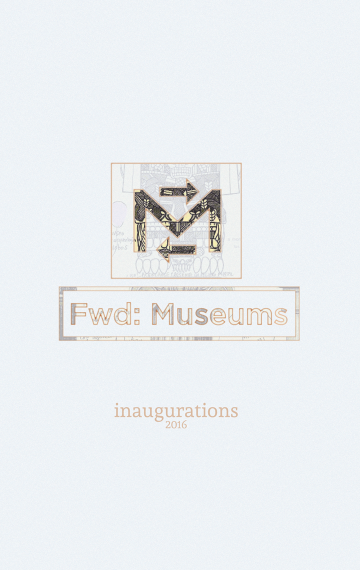 This volume explores the theme of inaugurations, or firsts and beginnings. Museums, like all other social institutions, reflect the tensions and contradictions of their times. The Museum and Exhibition Studies (MUSE) Graduate Program at the University of Illinois at Chicago proposes that these museum problems are deeply seeded in the field and its professions. It’s likely that their remedies will require some equally deep—radical—change and reimagining. Responding to the urgencies of the moment and recognizing the need to transform museums and our cultural work within their spaces, MUSE offers this new journal. Fwd: Museums signals a desire to lift up and forward ideas that might push our collective thinking. This volume explores the theme of inaugurations, or firsts and beginnings, with over 20 contributions from scholars and creative practitioners.